We at Ace eComm are masters in providing cutting edge and highly quality 3dCart Product Data Entry Services in the quickest turnaround time possible. Uploading product data through 3dCart backend can be quite time consuming and tedious process. If you try getting it done with the help of your in-house employees, it can majorly affect their productivity and eventually tamper the progress of your company. So it’s a wise decision to outsource your 3dCart Product Data Entry requirements. 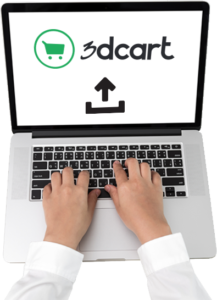 Assign us the task of setting up your 3dCart platform and we assure you won’t feel let down. Infact we’re so confident about the quality of our services that you may end up hiring us permanently for your ecommerce data entry needs. Our experts have the ability to obtain information from a multitude of sources such as hard copy catalogs, digital catalogs, scanned images, PDF files, supplier’s website and many other relevant online sources. We are experienced in adding product data directly into 3dCart database backend system via CSV or Excel spreadsheet template. We can add significant product attributes such as colour, weight, size, SKU no., model no., dimension etc. We assign specific categories and subcategories to your products to streamline them in an ordered fashion. This way online visitors can find your products easily. Our accomplished writers can pen down insightful and original product descriptions to convince the potential customer to buy the product. We make it SEO friendly to ensure high search engine rankings. We can also create your product page URL, product meta tags, meta titles and descriptions. Our skilled Image Editors can add suitable images to increase the salability of the product. They have the ability to convert low resolution images to tremendously beautiful images. If needed, they can also create, edit, resize, crop and tag product images. If you have a long list of products to be uploaded, you can rely on our 3dCart Bulk Product Data Upload Services. Our experts can ease the complex process with the help of bulk listing softwares and CSV files. We will keep abreast of the stock availability through our efficient inventory management process. We will monitor your competitor’s websites and give you feedback about the prices they offering to their customers. This way you can offer the best possible prices to your customers and stay ahead of the competition. Our 3dCart Product Data Entry team will also assist you with order processing and order tracking. This would make sure that the products are being delivered to your customers on time.